I recently started playing the OpenBeta Galactic Conquest as the Wraith and I ran into a bug. 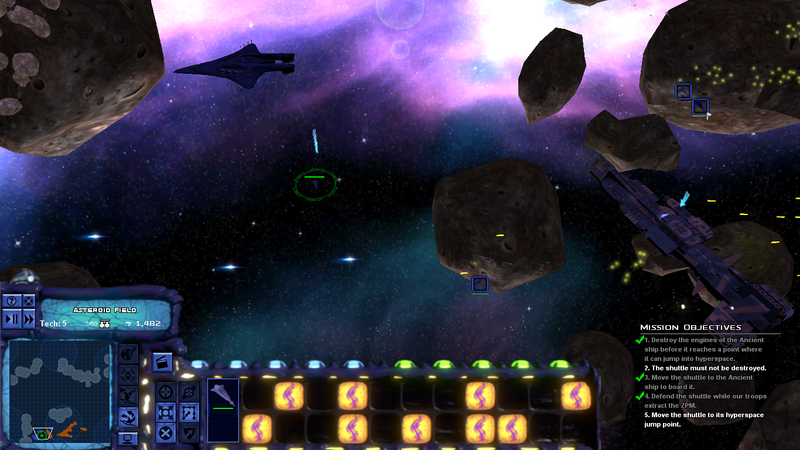 The mission was to recover a ZPM from an Aurora-class in the Asteroid field. After disabling the engines, a wraith shuttle appeared, which I used to board the Aurora-class. So far so good. Then, a distress beacon is send out and a massive Ancient fleet arrives. The 5th step of the mission is to have the wraith shuttle reach a "hyperspace" point, indicated by an arrow. This didn't work. I had the shuttle go to the arrow, but nothing happened. My ships just sat there until they were annihilated by the Ancient fleet. I reloaded and tried "retreating" with the shuttle still alive, but I was told I failed the mission because I didn't get the ZPM. I think it is worth mentioning that there was still an arrow pointing at the Aurora-class after the shuttle had finished boarding. Maybe the script for getting the ZPM didn't finish, which was why the wraith shuttle didn't hyperspace away? Sorry, I meant to upload this screenshot with the original post. Perhaps I am doing something incorrectly with the shuttle?